Maddy Denner (left) and Olivia O'Keeffe (right) lead a strong group in the distances at the Sac State Classic. SACRAMENTO -- On Saturday, March 3, the 14th annual Sacramento State High School Track Classic takes place at Hornet Stadium, the host venue for several U.S. Olympic Trials and NCAA Track Championships. Some of the biggest names in Northern California track and field are starting their competitive season at this meet which, weather permitting, could result in some top marks on the Mondo Super X lightning fast track. 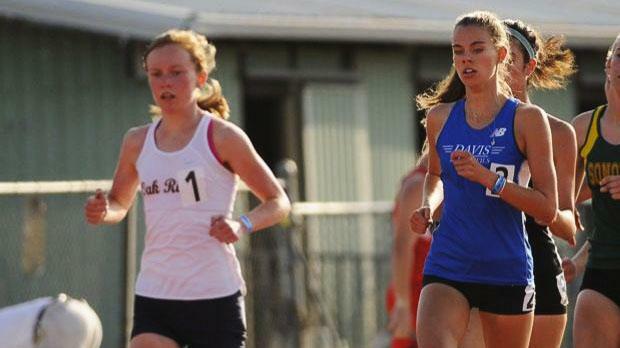 The marquee events on Saturday are the 1,600s where both boys and girls have stacked fields. On the girls side, the Denner twins from Oak Ridge HS, Maddy (signed with Michigan) and Elena (Notre Dame), line up against Davis High senior Olivia O'Keeffe (Washington), with all three having PRs under 4:50. These three are no strangers to each other having competed in cross country where O'Keeffe was the 2016 D1 State champion and this past season where Elena was 3rd in the D1 race. Maddy was on track for a stellar season, becoming the 9th woman in the history of storied Woodward Park to ever break 17:00 at the Clovis Invitational before having to cut her season short with injury. On the track, Maddy Denner is the defending State champion at 1,600 and O'Keeffe was the runner-up. Maddy Denner and Elena Denner finished 2nd and 4th, respectively, in the 3,200 at State last June. Additionally, there are several other runners who will be in the hunt to break 5 minutes including, Sarah Chaves (El Camino Fundamental), Clarissa Nowag-Nelson (McClatchy) and Gabriela Hernandez (Vacaville). The boys 1,600 is a murderer's row led by Brian Hastings of Las Plumas, who is the returning Northern Section champion. Matt Strangio (Jesuit) is coming off a stellar cross country season where he finished 4th in the D1 State final and was the highest finishing sophomore at the prestigious Nike Cross Nationals where he earned All-America status. Also in the field is Collin Ullrich (Liberty Ranch), who has recently committed to NCAA D1 Cross Country Champions Northern Arizona where he will join Armijo legend Luis Grijalva. Ullrich earned his All-America status at the Foot Locker Nationals where he was the highest finishing Californian. Rounding out the list of favorites is Karl Winter of Stockton St. Marys, who is more than capable of dipping below 4:20 and challenging the other favorites for the win. In the sprints Tierra Robinson-Jones of Bishop O'Dowd, (a Texas A&M commit), the state's top returner in the 400 (53.24) as runner-up last June, is entered in both the 100m and 200m. Robinson-Jones is using this meet to work on her top-end speed and using the season to build up the strength for a run at a State championship in the 400. Fellow 400 state finalist Alexis Surrell (Newark Memorial), who looks to be the class of the 400 field, will go toe to toe with Robinson-Jones in the 200, which should be a great early season test between two of the top long sprinters in the state. Super sophomore Imani Dupree (Sheldon) could get herself in to the mix for an upset with a good run in either of the sprints and a potential triple medal-winning day as she is a part of Sheldon's 4x100 team. Boys sprints appear to be pretty wide open. Femi Ajose (San Leandro) is the only runner coming in with a sub-11 time in the 100, but he is followed closely by 10 others with personal bests below 11.20. The 200 is a similar story where Damaris Burt (Kennedy) leads the seeds with his 22.01 ahead of seven other runners with records in the 22s. The boys 800 will likely be contested by Atwater's Abraham Maldonado and Vanden's Quinton Alexander, who come in with sub-1:55 times. But David Vincent (Jesuit), Patrick Wiseman (Christian Brothers) and Nick Myers (Pleasant Grove) all have times close enough to make the race interesting. In the girls race, O'Keeffe and the Denner twins are entered (though it is doubtful they will triple up on Saturday) and have three of the four fastest times, but Jaxin Woodward of Vacaville is the only one with a competitive time who is focusing on this event and could emerge the winner. Monterey Trail's Zachary Larrier leads returners in the 400 where he was a state meet qualifier last year as a sophomore. With some experience under his belt, he could break 48.00 if pushed and the conditions are favorable. Devin Bright (Cosumnes Oaks), Erik Ebert (Lodi) and Miles Duncan (De La Salle) make up the rest of the sub-50 contingent. Although most of the distance big guns have opted to run the 1,600s, there is still a lot of talent in the 3,200s. For the boys Jonah Weiner-Brodkey, who led McClatchy to a section championship in cross country, has the fastest seeded time but will likely be challenged by Drew Spencer (Oak Ridge) and Connor Livingston (De La Salle). In the girls race, the Denner sisters may choose to double up to work on some early season strength. Either way, the field is peppered with some of the best cross country runners from this past season in Sydney Vandegrift (St. Francis), Sophia Lodigliani (Davis) and Nowag-Nelson. The girls hurdle events appear to be one-woman races with Monterey Trail's Nia Collins leading entrants in both the 100 hurdles and 300 hurdles by a relatively substantial amount. For the boys, it could be anyone's race. Warren Williams (Merrill West), Nick Mederios (Christian Brothers) and Brett Gregorich (Vacaville) come in with the top times in the 100 hurdles. The 300 hurdles similarly have three runners with times a step ahead of the pack, including Pierre Scott (Cosumnes Oaks), Jaelen Craft (Newark Memorial) and Gregorich, who will take a run at a hurdle double. Sondre Guttormsen of Davis via Norway, who has signed with UCLA, has been cleared to compete by CIF and is coming off his first 18-foot clearance at the National Pole Vault Summit, which places him second on the all time California list behind the long time (1985) record of Brandon Richards at 18-2. Sheldon girls will be the favorites in all three relays, 4x100, 4x200, 4x400, with a strong and deep returning group of sprinters. Bishop O'Dowd has a fast group returning and will look to challenge Sheldon in the relays. In the throwing events, Sebastian Garcia (Jesuit) in the discus and Elijah Folau (Junipero Serra), in the shot put, are the clear leaders. The long jump will likely be a battle between two 22-foot jumpers in Jeremy Washington (San Leandro) and DeAndra McDaniel (Natomas). McDaniel will look for the double in the triple jump where his 46-6 jump is a full foot longer than another competitor. The boys high jump looks wide open with six athletes having personal bests of 6-feet or over, led by Jordan Delaney (Cosumnes Oaks), Aidan Doms (Davis) and Donovan Jones (Roseville). Kelly Kern from Carondolet, who looks to improve upon her freshman PR of 12-0 in the girl's pole vault.